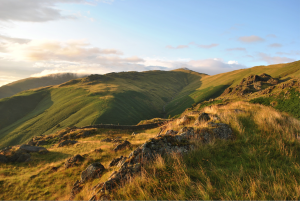 This interactive learning aid allows you to connect poems by the British Romantic poet William Wordsworth (1770-1850) to the places that inspired them in England’s Lake District, where Wordsworth grew up and spent most of his life. Viewer-manipulated videos and photographs enable you to “enter” the settings of poetic passages as you read them. Wordsworth actually composed some of these lines in or near the locations you can view. The creators1 of this digital tool hope that you will come to appreciate more deeply, and ideally share, Wordsworth’s conviction that poetry offers an irreplaceable language for articulating meaningful connections between humans, other living and inanimate things, and the environments they collectively form. Composed when large agricultural enclosures, mining, industry, and new economic theories were establishing the patterns of extraction and waste that have led to our global environmental crisis,2 Wordsworth’s poetry has nurtured the convictions and sensibilities that spurred the creation of national parks and the preservation of the Lake District itself. Yet even as we invite you to link Wordsworth’s poems to places he cherished, we encourage you to remember that such relationships are necessarily uncertain and evolving. The relationships this digital tool helps you perceive between the poems and their locations will be defined not only by any (apparently) direct correspondence between lines and places, but also by how Wordsworth has imaginatively and selectively portrayed details; how a place has changed since Wordsworth’s time (e.g. because of construction, tree growth, or weather conditions on the day of filming); and, of course, by your own experiences of the poems and images. Poems represented here3 come from 1800-1805, one of Wordsworth’s greatest periods. For the most part we produce only selections from poems, so we encourage you to read the whole poems on your own before (and, hopefully, after!) using this digital tool. Home at Grasmere (c. 1800) was unpublished, except for a small portion, in Wordsworth’s lifetime. It is nonetheless his most concentrated effort to imagine what it means to make a home in a particular place shared with other living things. Poems on the Naming of Places and Michael, a Pastoral Poem come from the second—1800—edition of Wordsworth’s and Coleridge’s Lyrical Ballads, one of the most important and influential collections of British Romantic poetry. Home at Grasmere is related to The Prelude, Wordsworth’s massive autobiographical poem, which was published after his death in 1850. This site contains a well-known passage from the 1805 version of The Prelude, in which Wordsworth recounts stealing a boat as a young boy and the life-changing impact of his ensuing experience on the lake. User tips: These pages contain embedded navigable videos as well as links to semi-spherical panoramas (photo spheres) and traditional photographs. When viewing a photo sphere, click on the info. button—white circle with an “i”—to see its label and location on Google Maps. 1 Created in summer 2016 under the direction of Dr. Joshua King with the assistance of Nicole Bouchard (videography and web design), Brennan Saddler (photography), and Elizabeth Travers (navigation and filming support). Filming and photography were done in the Lake District. 3 Unless noted otherwise, the text of poems is from Lyrical Ballads 1798 and 1800, eds. Michael Gamer and Dahlia Porter (2008).